I love bourbon. Right now, I'm on an Elijah Craig 18 kick, since I got a bottle of that one for my b-day, but other times it's Rock Hill Farms, Booker's, or Eagle Rare. And whenever I see a bourbon that I haven't actually tried before (rare), I order that one. The thing is, I usually order my bourbon neat, I don't mix with it much. However, since its Mixology Monday (hosted by the fine gents over at Scofflaw's Den), I figured I better post a cocktail recipe or two with bourbon. I've recently written recipes for some new bourbon cocktails, the Blackberry Julep and the Harvest Moon, so I thought I'd revisit a classic recipe instead. Combine ingredients in a shaker, stir well before adding ice. Add ice, shake well. Strain into a chilled cocktail glass. If you go the honey syrup route, I usually add 1 part hot water to 2 parts honey, then stir well and cool. The history: this cocktail was invented at the Vendome Club in Hollywood in the early 1930's, and it was their signature drink for a time. It was named after a brown derby hat-shaped restaurant on Wilshire Boulevard (shockingly, called the Brown Derby Restaurant, which was a popular celebrity hangout in it's day). Unfortunately, neither place is still there, although according to the notes in The Craft of the Cocktail by Dale DeGroff and Wikipedia, the hat is still there). Interestingly, the Brown Derby restaurant is considered the birthplace of the Cobb Salad. While I was in Indianapolis in April, Bruce Tomlinson and I went to a couple of places in search of great cocktails, including Nicky Blaine's in downtown Indy. Nicky Blaine's bills itself as a cocktail and cigar lounge. We had a couple of drinks (I had Booker's neat, and then water), and I had a cigar too (can't do that in a bar in Chicago anymore). Here are a couple of shots of the place - they have pictures of Kennedy and Lincoln at opposing ends of the bar to help guide your seating selection. At some point in the evening, the guy next to us, Ryan, exclaimed loudly "All this bar needs is a pole." Somehow this struck me as funny so I wrote it down. And then I forgot to actually post it until now. Better late than never, I figure. It's high time we have a chapter of the Ladies United for the Preservation of Endangered Cocktails here in Chicago, so I've taken up the charge and started one. We have nine members, all great ladies committed to dismantling the patriarchy one drink at a time. To continue the 150 year American tradition of dangerous women calling themselves Ladies and getting together in groups, clubs, and societies to work undercover while they chipped away at the patriarchy. To encourage the accumulation and use of vintage serving and barware." Our chapter has its own blog at LUPECChicago.blogspot.com as well as a page on Myspace. 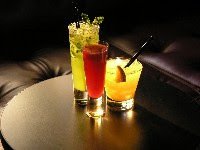 Keep an eye out for upcoming events, we hope to get involved in our community, both to promote great cocktails and to support great organizations in Chicago that work to improve the lives of women. Ever since the Kentucky Derby, I've been playing around with Mint Juleps now and then. Along the way toward the Belmont Stakes this weekend, I have been tweaking a recipe for a Blackberry Julep. Now this isn't the King of Cocktails' Blackberry Julep recipe - I was aiming for something of a hybrid between that recipe and the Mint Julep. Muddle the mint and simple syrup in a mixing glass. Add the liqueur and bourbon. 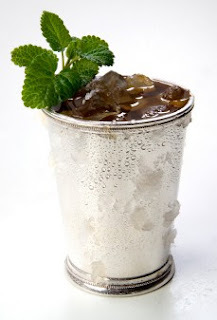 Strain into a highball (or julep) glass filled with crushed or shaved ice. Swirl with a bar spoon until the outside of the glass frosts up. Garnish with a sprig of mint and a fresh blackberry. I have been substituting that blackberry liqueur for Chambord lately, and its working pretty well - a nice change.